We are having a heat wave. 97 F as I am typing this. Temps were hitting 70C and I decided that discretion is the better part of valor. Changed the FSB from 1333 to 1066 and CPU over voltage from 102% back to 100%. Still gives me 1.80ghz@2.40Ghz and temps at 60C. I'll live with that for the next few days. Slowly but surely increasing my clocks. 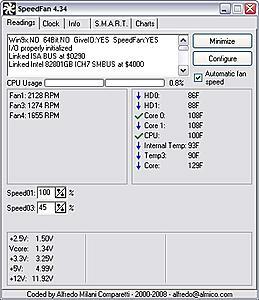 Currently at a stable 3.5GHz with very good temps! Come Winter it will be idling around 80F. Last edited by MUff1N; 17th August, 2008 at 09:29 AM. 54c now, under full load. I think that's allways a given around here! There are BIG differences between the Arctic Cooler Freezer 7 Pro & the Zalman All Copper CPNS 9700 110mm Coolers. This is the reason it took me so long to buy because it costs more than other coolers do...but well worth the money & wait. Maybe I'll do some looking and saveing! Should be able to buy it around the time fall gets here. One thing I notice about having an All Copper CPU cooler is the high load temps don't get near as high when compared to Aluminum. I did take the time to read "some" of the 1000 plus reviews out there on it & all said it was one of the best air coolers around for the price! *Bang for the Buck* and this is just using Newegg as source... "Review Summary (read all 1105 Review)"
Last edited by MUff1N; 17th August, 2008 at 10:51 PM. Wanna buy an an AC Freezer 7 Pro in a couple months? Do i need to mention it's hardly used? Wowsa, plenty hot enough in Spokane. Guess I better stop beefing about the temperature here! We a little on the toasty side alright, breaking records at 100 at the last I heard but my two brothers are down at Othello where it's 106. Poor little buggers. There is always water. Keeps me at a nice 41C on SMP FAH. That's like $200 or more. I can't do that. Even if I had the money i would't do that. I had sell off a number of things to get this build off the ground & there are two that are still sub par. The Video card and the sound card. 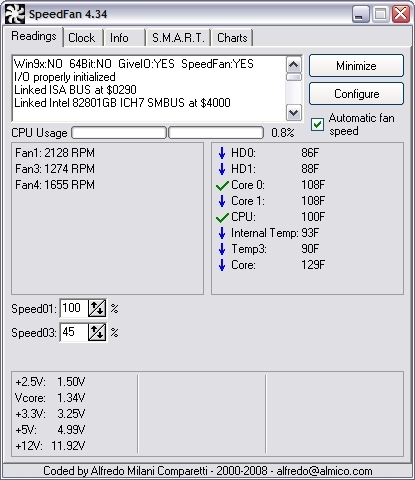 This Heat wave will be gone in a couple of days, and then I'll put the FSB back to 1333, it will run nicely 1.80Ghz@3.00Ghz, and I'll start working on a getting a better vid card. Last edited by PorPorMe; 18th August, 2008 at 12:21 PM.